SmartGlass provides efficient utilization of space for office interiors, offering instant privacy on demand at the flick of a switch. The quality and simplicity of SmartGlass provides the ideal environment of privacy for office interiors and conference rooms. SmartGlass can create small subdivisions of office spaces delivering instant privacy to carry out important meetings and presentations, without distractions from onlookers and co-workers eliminating the “goldfish bowl” effect. SmartGlass offers a sleek, sophisticated interior solution eliminating the need for curtains/blinds which can look dated and unpleasant. Each panel of SmartGlass is bespoke, so whatever your design and specification we manufacture to order, providing the perfect design solution for your project. 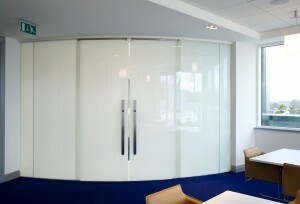 SmartGlass is the ultimate turnkey office partitioning system available offering a simple “Plug & Play” installation. SmartGlass is easily installed and can be utilized in many applications for instance; vacant/occupied, day/night and indoor/outdoor. Various configurations can be supplied including color tinted, fire-rated, double glazed, curved and shaped. Using a minute electrical current, users can immediately switch the SmartGlass from clear to private (opaque) and vice versa. When the glass is switched to its ”on” (clear) state the electricity consumption is particularly low making it an eco-friendly solution. SmartGlass provides simple, instantaneous and reversible states of transparency with no alteration of light level making it an ideal solution for office interiors where ample lighting is fundamental. This entry was posted in Articles, Smart Glass News and tagged electric privacy glass, Electronically Switchable Glass, LC smartglass, smart glass, smartglass, SmartGlass International, switchable glass, switchable privacy glass. Bookmark the permalink.